The fourth expansion tracks for the Formula D game, with the Grand Prix of Baltimore and Buddh tracks. Designed to be one of the fastest circuits of the championship, the Formula 1 circuit of Buddh, India stretches over 3 miles. Beware of your opponents, as the circuit has improved overtaking possibilities adding interesting twists and turns to the game! You’ve got nerves of steel? You will need them as you push the pedal to the metal on the Baltimore street racing circuit. Have fun managing your timing between braking and pushing your car to its limits so you can take-off like a rocket as you come out of corners. 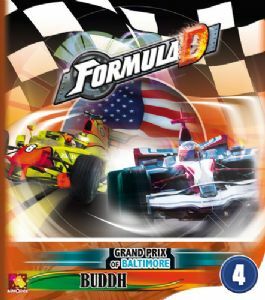 Not a stand-alone game, you must have Formula D in order to play. Formula D transports you into the turbulent world of Formula 1 and the the excitement of illegal street racing. The second track pack for Formula D has two classic Formula one tracks - Hockenheim and Valencia. Two more tracks for your Formula D experience, the Sotchi Olympic village track and street racing in New Jersey. On one side of the board is Sebring for Formula one racing and on the other Chicago for some wacky street racing. On one side of the board is a night racing course set in Singapore and the other is the winner of Asmodee's design competition.